Q. Does the Old Testament support the idea that a human embryo or fetus is not a living person? 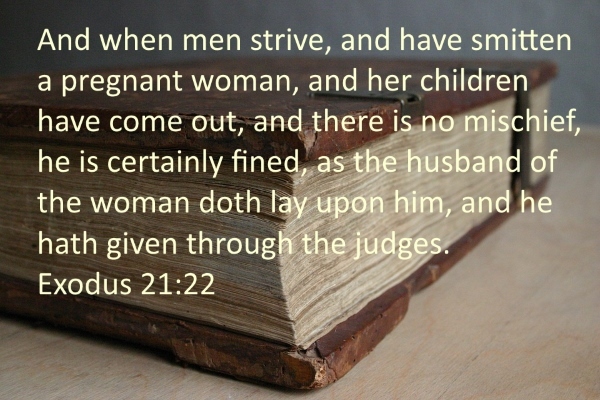 A literal translation of Exodus 21:22 shows that the word “miscarriage” is not in the original Hebrew. Also, the words “further” and/or “follow” are in neither verse 22 nor verse 23. A. Pro-abortionists sometimes cite a passage in Exodus to support their case. It is not about women having voluntary abortions but instead speaks of the possibility of two men fighting who accidentally hit a pregnant woman. The pro-abortionists, with the support of some Bible translations, say that, even though the woman miscarries—aborts a stillborn—the husband need only impose a fine on the man who hit his wife. If the woman is injured or killed, however, then the eye for eye and tooth for tooth principle must be imposed. Their interpretation, then, implies that unborn babies were considered mere property and not living people. But is this interpretation what the Bible teaches, or has it been concocted to make the Bible seem to support abortion?